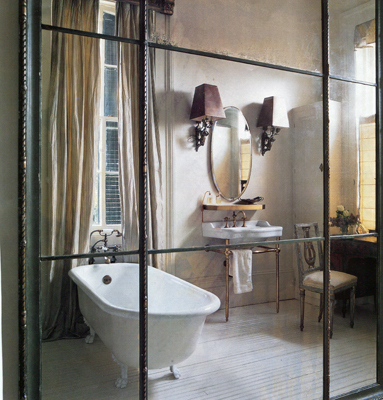 One of Architectural Digest’s most influential designers ANN HOLDEN of Holden & Dupuy in New Orleans creates visually lush interiors with the wave of her perfectly manicured hand. Ann’s creative ability is based on 30 years of experience that has taken her across the U.S. for commercial and residential projects that reflect a rich and timeless Southern style — elegant, yet livable and always gracious. I’ve always collected images of ANN’S projects, so it was difficult to narrow down just one to show you here, but I selected this 1869 Italianate house in New Orleans because it’s truly the essence of ANN’S trademark aesthetic. 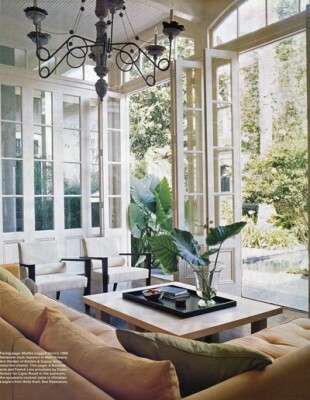 Southern homes were built to cope with intense heat and humidity, so many had rooms that opened to the outside and the sunroom above is a great example of that. I love the mix of dark hardwood floors, the sectional sofa, sleek armchairs by LIGNE ROSET and CHRISTIAN LIAIGRE cocktail table. 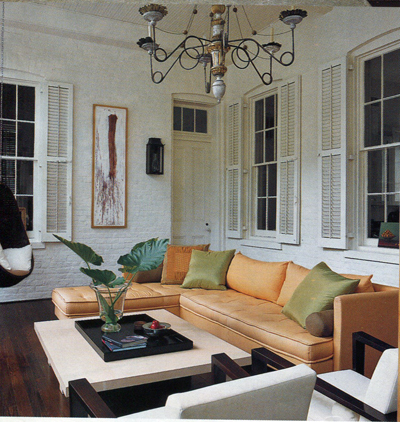 And what Southern porch is complete without a swing, so I love the egg chair by PIERANTONIO BONACINA. 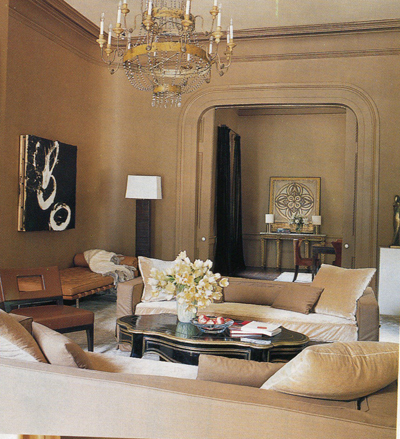 One dramatic decisions ANN made was the use of earth browns throughout the home. 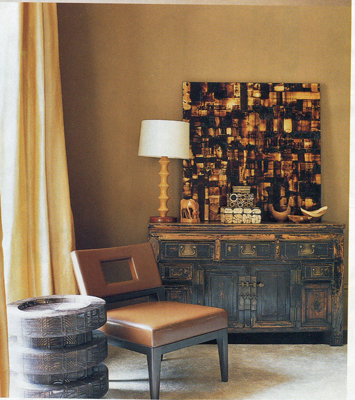 By using textures like silk, velvet and leather ANN added depth and richness to the room. The floor lamp is by LYLE + UMBACH. The sofas are CHRISTIAN LIAIGRE. ANN draped the floor-to-ceiling windows in gold silk which contrast nicely with CHRISTIAN LIAIGRE’S Chamane leather side chair and the beat-up antique bureau. Artwork rests atop of the bureau along with other found objets d’art. 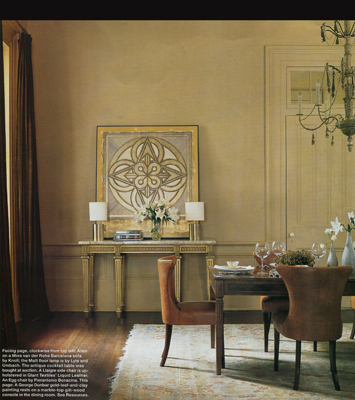 In the dining room, the use of petite gold lamps, a gilt wood console, antique rug and leather dining chairs offer a refined place to entertain. I love the gold leaf painting by Louisiana artist GEORGE DUNBAR. I bet this room is beautiful by candlelight. The beadboard floors, refurbished claw-foot tub, oversized sconces, the steel windows — all accented in copper and browns are pure perfection in the master bath. 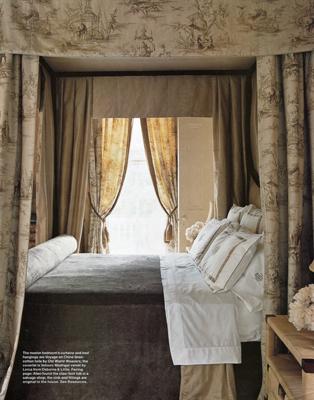 In the master bedroom, a four-poster bed draped in Voyage en Chine by OLD WORLD WEAVERS and the coverlet in Velours Madrigal from OSBORNE + LITTLE. The bed is dressed in LEONTINE LINENS.